Hello from the ridiculously white great north! Yes, we got a lot of snow. The report was 20-something inches, but the wind gusts dispersed that into drifts, so it wasn't an even layer of snow... in most places. It was blown clean over here and over your head over there with an extended peak at the top making it clear which direction the wind came from... for hours. I'm not going to bore you with my sob story of how long it took me to dig myself out (or the fact that I haven't even finished yet!) because Yoopers everywhere have their own story. And many had it worse. I want to talk about the snow being FUN! Because, before the storm, I was dedicated to making the Copper Harbor tunnel luge right off my front porch. Yup, that's right. A tunnel luge. It took a few random hours of digging when I could get outside according to Wee-man's schedule. But the day before the storm was predicted to come, one friend watched Brady P while two of my girlfriends came by to help me dig until the bottom tunnel met the top tunnel. Oh, glory and joy in my heart!!! We did it!!! Then we quickly tried to shape the rest of it to get a smooth ride from the top to the bottom -- a length of approximately 30 feet. Haha. The smooth ride never happened. But we rode anyway with our limbs whipping around and voices squealing. Here's a video of one of the pioneer rides! Oh, man. It was so fun. We had about a dozen people try it out the first day. And the next day, some of the town's school girls came and sledded for three hours! I was elated. That was exactly what I wanted to do -- create something fun to bring the community together over outdoor activities. I mean, that's the mission of Copper Harbor Vitality! We sledded for those couple days, but then it snowed and snowed and snowed as I mentioned above. I did a few runs today to see how much work the luge needs. The tunnel needs to be dug out a bit. I'm not normally claustrophobic, but I started to feel that way as I wriggled myself out backwards at the bottom. The only problem is that I can't find my scoop shovel! I honestly think it's buried in the snow. Well, I'll get that baby up and running again, don't you worry. If you want to come and check it out, please do! Just bring a shovel. Wink. And now for a special offer! All this snow is very, well, white. And I'm a woman who loves bright colors. Do you know what is full of bright colors? My wildflower pictures! Right now, I'm offering a great sale on all items on the Copper Harbor Vitality website of buy 2, get 1 free! Woohoo! Put a little color in your life, save some cash and support one of your favorite artists! Sounds like a triple win to me! Just use the coupon code 3COLORS at the checkout. And start shopping here! The offer expires on St. Patrick's Day. Thanks again for reading. You are a rare breed -- a person who reads! Now that looks like a real blast, what fun!. 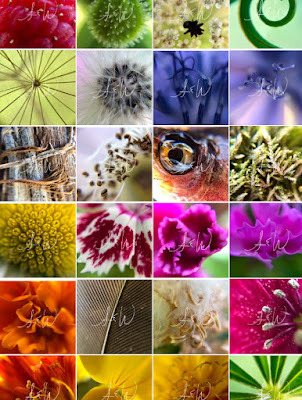 I can also attest to the intricate beauty of Amanda’s colorful photos so buy them up now while you can, such a deal. Oh ya!